We’ve all been there right? A client or stakeholder stomps in and tells you exactly what you need to make. 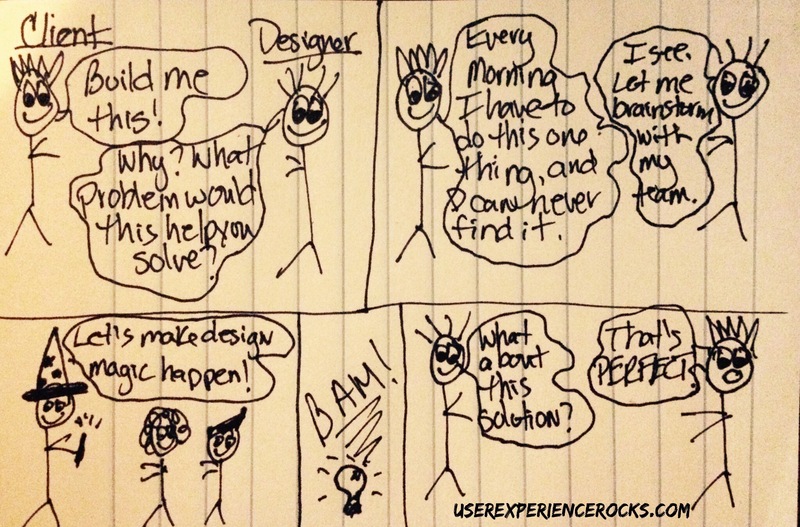 If you’re new to the design biz, your knee jerk reaction may be to make it. On command. Immediately. The longer you spend in the design world, the more you realize that building on command never, ever ends well. People usually ask for things they want, not necessarily for what they need. Case in point, a buddy of mine works for a major design firm. They have a program in which senior designers mentor newbie junior designers when they first come in the door. At the start of his career, about 10 years ago, my friend was that newbie designer. His first week, his mentor had a meeting with a sizable client, and invited him to come in and shake some hands, and observe the kick off session. As soon as they all sat down, the clients immediately whipped out a comp that outlined exactly what they wanted, down to the colors and fonts. They basically predesigned the entire project. My friend the newbie admitted that the sudden left hand turn in the conversation made him squirm a bit. He said the clients were visibly very uncomfortable, and he was sure that they were going to storm out of the room. After an hour long discussion, his mentor had a full list of goals to take back to the rest of the design team, as well as the client’s blessing on taking a week to brainstorm the best possible solutions to meet those goals. When my friend the newbie designer caught up with his mentor in the hall after the meeting, he told him he couldn’t believe that he “stood up to them” like that. My friend said that those 3 sentences completely changed the trajectory of his entire career. He knew at that moment that he wanted to become a great designer. And as it turns out, he did.